Justice served: Kugan’s mother Indra Nalathamby leaving the court. 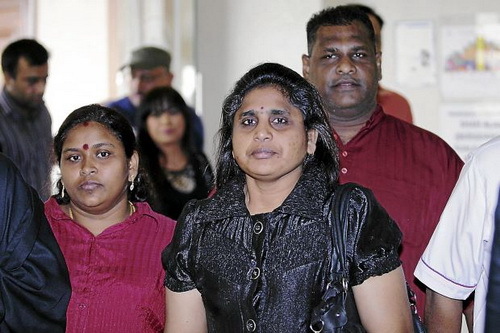 Kugan’s family was awarded RM751,709 in damages and another RM50,000 in costs. Our enforcement officers must appreciate, if not be made to appreciate, that it is the cornerstone of our criminal justice system that a person, including a suspect, is innocent until proven guilty. ON June 28, Justice Datuk V.T. Singham indeed retired with a bang! Two days before his retirement, he awarded RM751,709 in damages and another RM50,000 in costs to the family of Kugan Ananthan who died while in police custody on Jan 20, 2009. Singham held that the then Selangor police chief Tan Sri Khalid Abu Bakar, now the Inspector-General of Police, had committed misfeasance in public office. In delivering his judgment, he also reportedly urged the government to urgently set up the Independent Police Complaints and Misconduct Commission (IPCMC) as recommended by the 2005 Royal Commission to enhance the operation and management of the Royal Malaysia Police (RCI). However, at the time of writing this piece, his written judgment is still not available. In any event, the government and the IGP are expected to appeal against his decision. This reminds me of the case of Mohd Anuar Sharip who vomited blood, collapsed and died in a police cell on Aug 19, 1999. In June, 2010, Justice Lee Swee Seng awarded about RM1.6mil in damages to his widow, Suzana Mohamad Aris. However, Lee’s decision was subsequently reversed by the Court of Appeal. 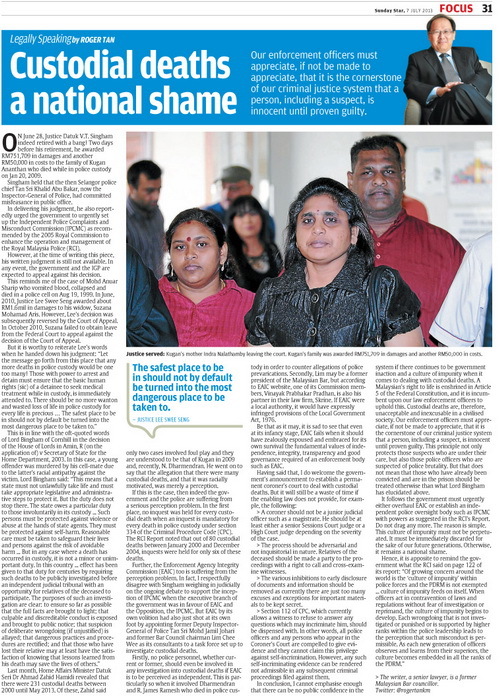 In October 2010, Suzana failed to obtain leave from the Federal Court to appeal against the decision of the Court of Appeal. Last month, Home Affairs Minister Datuk Seri Dr Ahmad Zahid Hamidi revealed that there were 231 custodial deaths between 2000 until May 2013. Of these, Zahid said only two cases involved foul play and they are understood to be that of Kugan in 2009 and, recently, N. Dharmendran. He went on to say that the allegation that there were many custodial deaths, and that it was racially motivated, was merely a perception. If this is the case, then indeed the government and the police are suffering from a serious perception problem. In the first place, no inquest was held for every custodial death when an inquest is mandatory for every death in police custody under section 334 of the Criminal Procedure Code (CPC). The RCI Report noted that out of 80 custodial deaths between January 2000 and December 2004, inquests were held for only six of these deaths. Further, the Enforcement Agency Integrity Commission (EAIC) too is suffering from the perception problem. In fact, I respectfully disagree with Singham weighing in judicially on the ongoing debate to support the inception of IPCMC when the executive branch of the government was in favour of EAIC and the Opposition, the IPCMC. But EAIC by its own volition had also just shot at its own foot by appointing former Deputy Inspector-General of Police Tan Sri Mohd Jamil Johari and former Bar Council chairman Lim Chee Wee as its consultants to a task force set up to investigate custodial deaths. Firstly, no police personnel, whether current or former, should even be involved in any investigation into custodial deaths if EAIC is to be perceived as independent. This is particularly so when it involved Dharmendran and R. James Ramesh who died in police custody in order to counter allegations of police prevarications. Secondly, Lim may be a former president of the Malaysian Bar, but according to EAIC website, one of its Commission members, Vinayak Prabhakar Pradhan, is also his partner in their law firm, Skrine. If EAIC were a local authority, it would have expressly infringed provisions of the Local Government Act, 1976. Be that as it may, it is sad to see that even at its infancy stage, EAIC fails when it should have zealously espoused and embraced for its own survival the fundamental values of independence, integrity, transparency and good governance required of an enforcement body such as EAIC. > A coroner should not be a junior judicial officer such as a magistrate. He should be at least either a senior Sessions Court judge or a High Court judge depending on the severity of the case. > The process should be adversarial and not inquisitorial in nature. Relatives of the deceased should be made a party to the proceedings with a right to call and cross-examine witnesses. > The various inhibitions to early disclosure of documents and information should be removed as currently there are just too many excuses and exceptions for important materials to be kept secret. > Section 112 of CPC, which currently allows a witness to refuse to answer any questions which may incriminate him, should be dispensed with. In other words, all police officers and any persons who appear in the Coroner’s Court are compelled to give evidence and they cannot claim this privilege against self-incrimination. However, any such self-incriminating evidence can be rendered not admissible in any subsequent criminal proceedings filed against them. In conclusion, I cannot emphasise enough that there can be no public confidence in the system if there continues to be government inaction and a culture of impunity when it comes to dealing with custodial deaths. A Malaysian’s right to life is enshrined in Article 5 of the Federal Constitution, and it is incumbent upon our law enforcement officers to uphold this. Custodial deaths are, therefore, unacceptable and inexcusable in a civilised society. Our enforcement officers must appreciate, if not be made to appreciate, that it is the cornerstone of our criminal justice system that a person, including a suspect, is innocent until proven guilty. This principle not only protects those suspects who are under their care, but also those police officers who are suspected of police brutality. But that does not mean that those who have already been convicted and are in the prison should be treated otherwise than what Lord Bingham has elucidated above. It follows the government must urgently either overhaul EAIC or establish an independent police oversight body such as IPCMC with powers as suggested in the RCI’s Report. Do not drag any more. The reason is simple. This culture of impunity must not be perpetuated. It must be immediately discarded for the sake of our future generations. Otherwise, it remains a national shame.